Skowhegan teams look for big gains. Last February, the Messalonskee boys indoor track team won its first Kennebec Valley Athletic Conference title. Although the Eagles graduated a number of key athletes, the team returns a strong group that can contend for another crown — as well as a number of individual championships — at the conference and state level. Messalonskee’s aspirations could depend on the return of senior middle distance runner Owen Concaugh. The defending Class A state champion in the outdoor 800 meters, Concaugh suffered a broken leg in the soccer season and will miss most, if not all, the indoor track season. “If we can get Owen back, we’ll be right there,” coach Matt Holman said. Still, the Eagles boys team has depth. Senior Tanner Burton is the defending conference champ in the 55 hurdles and a contender for the state title in the event. Senior Zach Hoyle is strong in the middle distance events and senior Dylan Labun is a contender in the pole vault. Cam Bickford (shot put) and Dan Turner (800) also are among the top in the conference in their events. The Messalonskee girls are led by Avery Brennan and Haley Lowell in the middle distance events, as well as Lauren Pickett in the jumps and sprints. 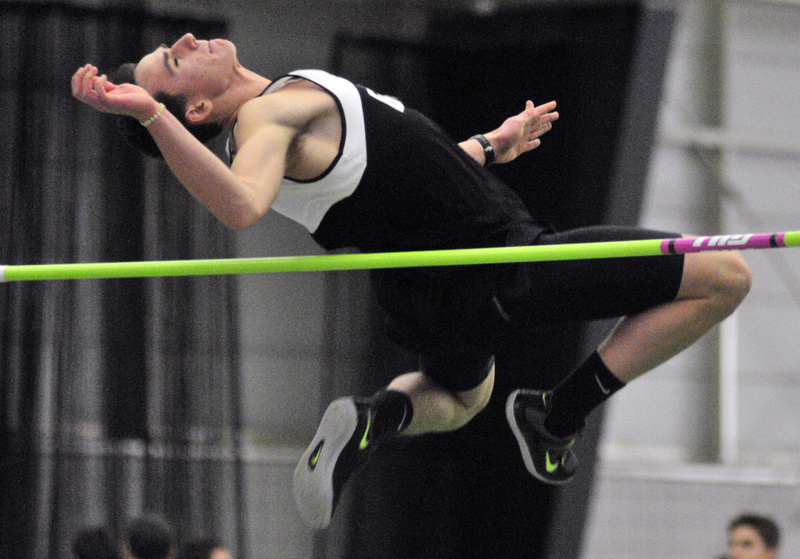 Pickett placed third in the high jump at the conference meet last season. Peyton Arbour is a contender in the distance events. Skowhegan graduated one of the best athletes in the state in Maddy Price, but the Indians return top jumper Leah Savage. A junior, Savage placed second in the long jump and third in the triple jump at the Class A outdoor championship last spring. 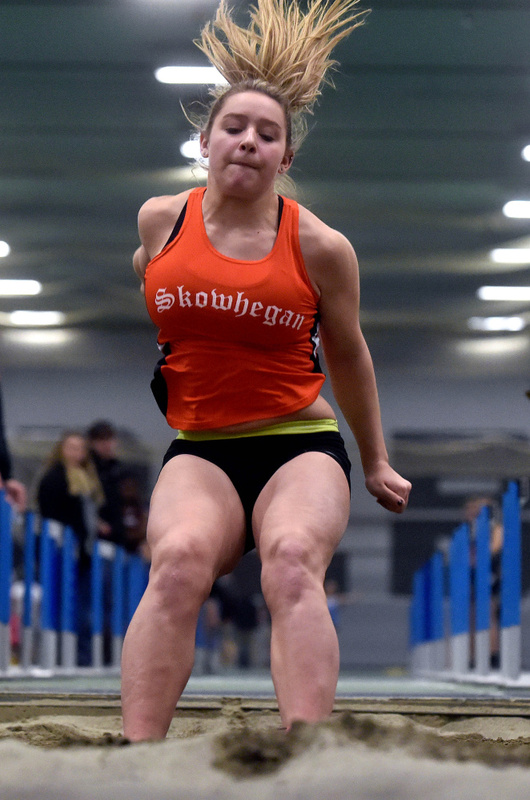 “I see Leah being a 37, 38 foot triple jumper,” Skowhegan coach Dave Evans said. Maliea Kelso (sprints) and Chloe Thorndike (jumps, sprints) also could be key contributors at Skowhegan. On the boys side, Skowhegan is young, with a talented freshman class that Evans expects could do well quickly. 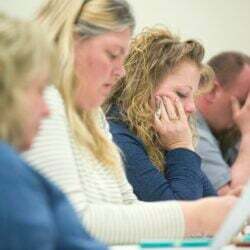 “We’re bringing in some pretty darn good young people,” Evans said. After not placing at the state championships last year, Cony is looking to make some noise in the KVAC A on the boys side. The Rams will field a highly competitive 4×800 team with Jeff Bilodeau (fourth in the 55 hurdles at KVACs), Jack Wroten and James Olivier back, while seniors Aaron Emerson, (10th, 400; 11th, 200) and Bryant York (middle distance) add depth in the running events. The Rams will need it, too, as with their low numbers in throws and jumps, they will have to do most of their work on the track. Low numbers are the story on the girls side, where only five athletes will comprise Cony. Zinaida Gregor is the leader, having finished 11th in the 400 at the KVAC A championships last year. Numbers are up at Lawrence, with 29 girls and 24 boys out for the team. Senior Jaden Gray (distance) and junior Hannah Walsh (middle distance) are among the top returning members of the girls team. For the boys, Ben Copeland is the defending conference pole vault champion. In Class B, Waterville is the defending KVAC champion for both boys and girls. The Purple Panthers have a new head coach, former assistant coach Ted Brown. Isaac Pellerin is a top returner for the Waterville boys in the pole vault after placing fourth in the state meet last season. Ethan Nurick finished fourth in the triple jump at states last year. Brown also expects the 4×200 relay team of Jesse Workman, Theo Heaven, Kyle McGadney and Kai Rabideau to have a strong season. For the Waterville girls, Sarah Cox and Jennasea Hubbard should contend in the shot put. Newcomer TT Brandon could be a factor in long jump and sprints. Erskine will look to hang near the top of KVAC B after the boys and girls squads finished fourth last season. Chris Weymouth, who won the high jump and was fourth in the triple jump and long jump at the KVAC championships as a freshman, leads the boys team. The Eagles also have a reliable scorer in the distance events in senior Joey Gay, who was seventh in the mile and eighth in the 2 mile but could become a top-five finisher this winter. The girls will rely heavily on points from Jordan Jowett, who rolled at the KVACs to a second-place finish in the 200 and third-place result in the 55. The Eagles have another top-tier scorer in Mayann McGrath, who was third in the long jump and fifth in the triple jump at the KVACs and is a threat to win both this year. Hunter Mahon was ninth in the 800 last year, but Rollins likes her chances to secure points both there and in the high jump as well. “Our goal is really to get as many as we can to qualify for those championship meets, KVACs or states, and trying to get them to their best,” Rollins said. In senior Ben Smith, the Winslow boys have a contender for the state title in the sprints. Smith won the KVAC 55 and 200 last season. The Winslow girls have a strong jumper in senior Paige Smith, who is recovering from an ACL injury, coach Ken Nadeau said. The Maine Central Institute girls are led by Allison Hughes, the defending conference shot put champion. Abby Bernier and Caitlin McKenney give the Huskies contenders in the 400. The MCI boys were hit hard by graduation, but return Hayden Boreham, a contender in the 400 and triple jump. Nokomis lost Erin Martin, the conference Class B 55 hurdle champ, and look to rebuild with newcomers Audrey Kimball and Jayde Whitten. The Nokomis boys also look to improve with a number of new faces.